Celebrate 101 years of Le Tour in 2014 with a younger tradition – DiscoverVin’s Taste the Tour Pack. DiscoverVin wines from the Pyrenees, the Rhone and the South West of France matched to stages through these scenic appellations. 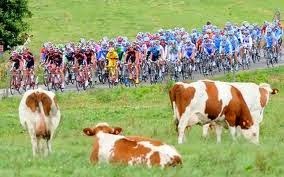 It’s that time of year again; time to enjoy the legendary Tour de France. Enjoy the sights of the racing and the stunning scenery whilst enjoying this selection of French wine. The wines in this 6 pack are sourced from vineyards in the Pyrenees, the Rhone and the South West of France - regions that the 2014 Tour passes through in the second week as the battle for the yellow jersey really hots up! They represent value for money and are a great introduction to DiscoverVin’s wines. And at a fraction of the price of a ticket to France! The ride crosses the Rhone River after a category three climb of the Col de Croix de Montvieux. It then heads east with a final climb up Chamrousse, an 18.2 km mountain with an average gradient of 7.3%. From a biodynamic producer on the Cotes du Rhone a delicious Grenache/Shiraz! Excellent value for money for the quality of this artisanal wine. Suggestion: Enjoy this wine with meat dishes like braised beef with carrots, Navarin lamb or chicken casserole. A long transition stage across the Provencal hinterland to round off the second week of the Tour. It appears unlikely that the sprinters will be thwarted in this majestic finish opposite the Nîmes arena. Cru Classé rosé from Provence. Rosé seems to be popping up everywhere these days - see what the fuss is about! Pale pink, elegant nose with citrus fruit aromas. Supple, fruity with a soft and silky "finale". A great wine to enjoy on any day of the tour to evoke the French summer as you watch La Tour wrapped in a rug! At 125 km, the shortest stage comes just after the longest. A difficult stage through the mountains of the Pyrenees. Three category one climbs including the Col de Peyresourde before finishing in the mountain ski resort town of Saint Lary Pla d’Adet. A delightful, complex, fruity but dry wine. From the excellent 2011 vintage, this wine is from one of the most beautiful and under rated regions in France. 92 points Huon Hooke. A great alternative to sauvignon blanc. Tropical fruits and citrus on the palette. Crisp dry finish. Our best selling white. Suggestion: It would be a perfect match with seafood and shellfish, but also goes down a treat with pre-dinner nibbles and dips as you watch the highlights. Today the riders start in Pau the city of Henri IV - who was baptised with the wine of Jurancon. Pau has welcomed the race in style, 65 times, which puts it on the podium with Paris and Bordeaux as the most visited cities of the Tour. Today they climb the Col du Tourmalet, always a challenge. Next up, the final climb up Hautacam, which has earned a hallowed place in the history of the Tour. Sit back and enjoy the ride as with one of the famous wines of Jurançon. The nose presents notes of honey, apricot and peaches. The palate is fresh, powerful yet smooth. Petit Manseng at its very best with fabulous length and balance. This wine, like many from Jurançon, is pleasantly sweet without a cloying finish. Best served with one of the classic cheeses of the region or a fruit gateau. 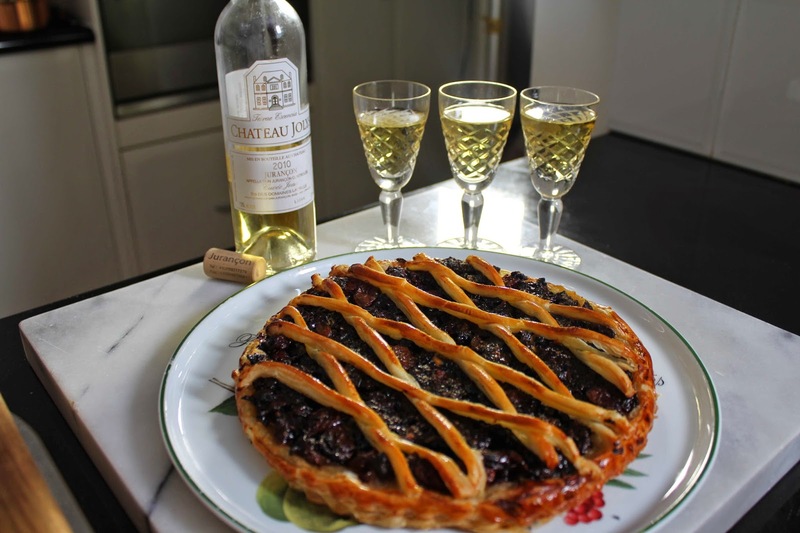 Suggestion: We have seen a photo of a gorgeous Gabriel Gaté gateau matched to this wine. Might this be his recommended food and wine match while in Pau for the Taste of the Tour? The tour leaves the mountains of the Pyrenees. Today’s departure is from Maubourguet Pays du Val D’Adour in the foothills of the Pyrenees. An area of plains and hills, the Pays du Val D'Adour is at the crossroads of the Béarn, Bigorre and Gascogne cultures. Maubourguet, the name of the common was chosen by its inhabitants to inspire fear to possible invaders. But the “Bad Village” will certainly be far more hospitable to the riders. This 208 km stage is completely devoid of any real difficulties and, on paper at least, should smile upon the sprinters. There could be a surprise breakaway. This is a powerful multi-award winning wine from a well-regarded producer in the Madiran region. This domaine aims to produce a wine “in a style that brings out the heart and soul of south-west France. The wines of this region date back to roman times but were made famous by pilgrims passing through the region. Made from 70% Tannat and 30% Cabernet Sauvignon. A beautiful deep purple colour. An intense and savoury nose with black fruits, vanilla and leather. A concentrated palate with rich black fruit and peppery spices balanced with great structure, fine chalky tannins and acid. Intense, powerful but great length and balance. Suggestion: Perfect with lamb shanks or duck breasts. Keep an eye on our Facebook page and website for suggested recipes! What happens in the organisers' dreams? The final winner is decided in this 54 km time trial. Bergerac, the second city of the Dordogne area has only been visited by the tour twice before but has a long history of wine making. The Bergerac region is picturesque and historic with bastides (walled towns) medieval cities, chateaux, Romanesque churches and abbeys and gorgeous stone villages full of character and history and some exciting wines. A classy Merlot/Cabernet (60:40) blend from a sought after biodynamic producer. This complex beautifully balanced and satisfying red wine is from one of Bergerac’s renowned producers Luc De Conti. Suggestion: It is a superb tasty wine that goes well with game, duck, stews and cheese. Bordeaux Wine Festival - Fete le Vin!